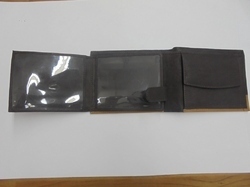 Manufacturer of a wide range of products which include men's leather trifold wallet, leather trifold wallet and trifold wallet. Description :Men's leather trifold wallet featuring: leather made in italy 4 credit card slots 2 bill compartments 1clear id/photo window “columbus” woven fabric lining inside complimented with metal “c” logo on the top. Description :Leather trifold wallet featuring: leather made in italy 4 credit card slots 2 bill compartments 1 clear id/photo window “columbus” woven fabric lining inside complimented with metal “c” logo on the top. Looking for Leather Trifold Wallets ?